Same here. My greetings to all the Ipohworld’s bloggers and Ipoh local past, present and future. Kong Hee Fatt Choy to you Katherine and all readers of ipohworld. May the Year of the Rabbit brings happiness, good health and prosperity to everyone. Kung Hei Fatt Choy! May the new lunar year bring much happiness, success, prosperity and good health to everyone. 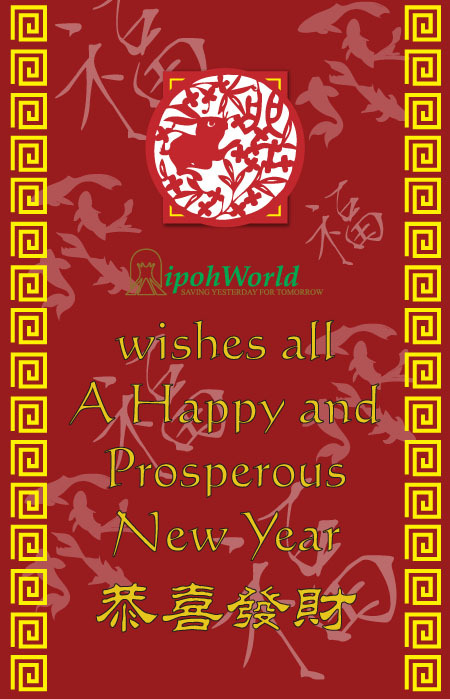 Our Best Wishes to all who visit ipohWorld this most auspicious time, in this, apparently and according to experts in Chinese astrology, the luckiest year of the Rabbit/Cat. Thank You, S. Sundralingam, for starting off the celebrating with us all! This is the wonderful part of ipohWorld, in Malaysia, like Canada too, that we all immerse ourselves in each other’s culture to soak in the abundance and joy of living in goodwill and peace. May you all enjoy Good Health as a result! Cheers! Felicitations and Season’s Greetings to all Ipohworld bloggers from the snowy Midwest. Hope everyone will celebrate the festivities with friends and family. Eat, drink and be merry; worry about the indigestion later. Cheers and ‘Yam Seng’. Kong Hee Fatt Choy to the guys and gals of Ipohworld! Gong Xi Fa Cai to all you – Ipoh ites local & overseas. Ipohans or Ipohites? I’d like to be politically correct. Was a poll taken as to preference for a name for people who live/lived in Ipoh? Will appreciate comments on this. I may have read somewhere before but cannot find discussion site now. I believe it was Margaret Mead who once said, “Never doubt that a small group of thoughtful, committed citizens can change the world. Indeed, it is the only thing that ever has”. Yes, gratefulness is a good thing. We should all be so thankful to be blessed with a site like ipohWorld and blessed with the people who visit it. Thanks again, Ian, Felicia and all contributors and visitors to this site! UV@Valiant Knight: Wishes are like dreams … Sometimes, they do come true too … Hope all of yours manifest for you!